Boston cartoonist Nick Thorkelson speaks about his book, Herbert Marcuse, Philosopher of Utopia (City Lights), a graphic biography of the life and work of the respected modern philosopher..From his youth in Weimar Germany and early studies with Martin Heidegger, to his flight from Nazi Germany with Frankfurt School colleagues, to his rise as one of its major theorists along with Theodor Adorno and Walter Benjamin, to his status as a countercultural icon, readers are introduced to the development of Marcuse's philosophical theories and the political realities that shaped his work. Mentor to a young Angela Davis and often referred to as the unofficial faculty advisor to the New Left, Marcuse's controversial critique of the "comfortable unfreedoms" of post-WWII capitalism entered popular consciousness with the 1964 publication of One-Dimensional Man, which sold over 100,000 copies in its first years in print. 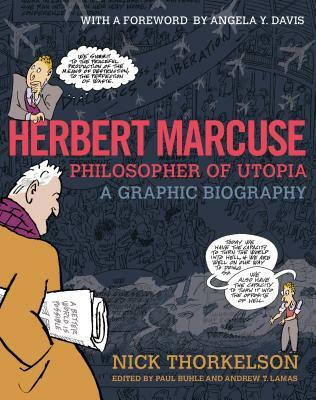 "Nick Thorkelson's exploration of the ideas and personality of Herbert Marcuse is exactly the sort of comic book I have longed to read. It is engaging, artful, and explores the world of revolutionary ideas. Books like this keep the fire going inside." -Joe Sacco. Also appearing on tonight’s program are Leonard Rifas, writer and historian, Educomics founder and pioneer of pedagogical comics and Wendy Call, a recent writer-in-residence at Seattle University, New College of Florida, and Harborview Medical Center who is co-editor of Telling True Stories: A Nonfiction Writers’ Guide and translator of Mexican poetry and short fiction.